Google Maps Mania initially reviewed 2itch back in June, when 2itch offered information for 2000 24 hour businesses in LA, Seattle and New York. 2itch now also offers business information for San Francisco and Chicago and the ability for anyone to add information about any business anywhere in the world. 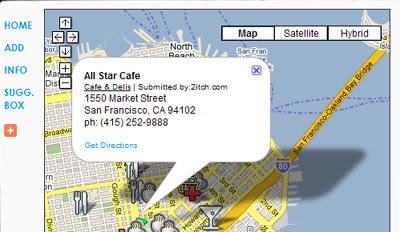 2itch shows the location of businesses that are open 24 hours a day. Each business is shown on a Google Map. Clicking on a map marker opens an information window with the businesses address and a link to driving directions. YellowHours is a new start-up that lets users check the open hours and location of businesses in their local community. The site is a social community that uses local community members to collaboratively build an accurate local business lists with information such as hours and location. YellowPages uses a familiar search method, users search for a type of business in a particular location. The results are presented with the name and address of the business and with user ratings, opening hours and the location shown in Google Maps. The location is shown via two static Google Maps. Initially the location is shown with a static Google Map of the location that is zoomed out. However when the user rolls over the static Google Map it changes to another zoomed in static Google Map. Not so static after all.